The OST file comes into existence when the cached mode is enabled from Outlook when its profile is configured with the MS Exchange Server. 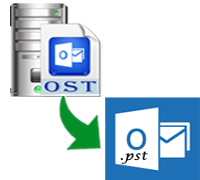 The OST file allow user to work in offline mode and any modifications made during offline mode is synchronized when connected with the MS Exchange Server. Unless connected with server, OST file contains replica of user’s mailbox before synchronization. That is why OST files are prone to issues leading to inaccessible/corrupted OST files. The article will be discussing on how to recover data from such files. Exceeding the size limit of OST file creates performance issues that can make OST file corrupted. Manual Method :- Outlook Users can use an inbuilt utility scanost.exe to recover OST files that was present until MS outlook 2010 version. After that, scanpst.exe has been used for recover of both OST and PST files. Though the method makes the corrupted OST to healthy one, it takes unnecessary time and data are not recovered completely. Third Party Tool :- Since the manual method cannot give desired results, users switch to third party tools like Exchange OST Recovery. The tool can successfully recover all the data items like emails, calendars, contacts etc. into PST format keeping the original formatting of all items intact. The users can apply Mail Filter to export only the desired mails that are in and between the date ranges specified.